As promised earlier, here is today’s political post! I have to say that I actually enjoyed reading this article, and I’m pretty caught up in American politics at the moment, which is odd, considering I live in the United Kingdom, but as they say, when America sneezes, the whole world catches the cold. As before, the link to the full article is below. Enjoy! 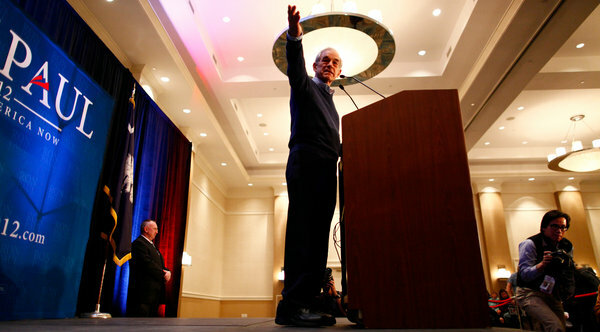 Representative Ron Paul, on Sunday in Myrtle Beach, S.C., is working to amass delegates. LAKE JACKSON, Tex. — Ron Paul says he has by no means given up on winning the Republican presidential nomination, but he acknowledges that he might not make it. So even as his aides plot a strategy to pick up delegates, they are beginning to plan how to use the leverage they are gaining to try to force the party to take his and his supporters’ views into account, signaling what Mr. Paul would want to party officials and rival candidates who are eager for the backing of his fervent following but nervous that he might undertake a third-party bid. One person close to the Paul campaign said this could include support for greater transparency at the Federal Reserve, a commitment to address what Mr. Paul views as the Patriot Act’s infringement on civil liberties and a curb on the powers of any president to wage war without Congressional approval. And the campaign wants Mr. Paul’s supporters to have a voice and a role in the national party machinery — just like they do in many state Republican parties — no matter who becomes the nominee.